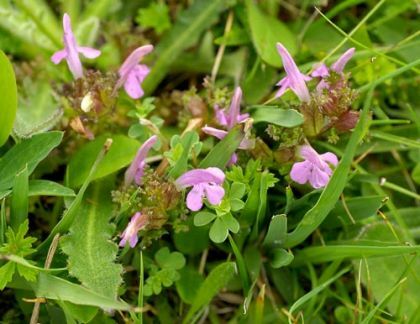 This perennial wildflower is commonly found growing on damp, peaty soil and bogs. It grows very low to the ground with numerous unbranched stems carrying dense little spikes of pale pink flowers from April to July. These flowers (20-25mm long) are two-lipped, the upper lip toothed at the tip only, and they emerge from an inflated, veined lobed calyx. The leaves are fern-like with lobed leaf segments. This is a native plant belonging to the family Orobanchaceae. I first recorded this plant growing near the Upper Lake at Glendalough, Co Wicklow in 1976 and photographed it at the same place in 2005. 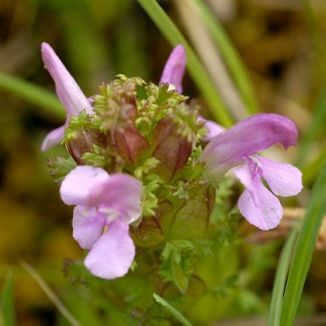 The Latin word 'pediculus' means 'louse' and the common name Lousewort was given to this little plant originally as it was thought that it gave lice to livestock grazing on it. Subsequently it has been found to carry snails and possibly the liver-fluke larvae may be introduced to stock this way. It is a hemi-parasitic plant which feeds on minerals and water from other plants. The plant is also known as Dwarf Red Rattle.